Located in downtown Montreal, on the 3rd floor of the Forum, site of the historic arena where the Canadiens won 24 Stanley Cups, we’re across the street from great shopping at Alexis Nihon plaza, surrounded by stores and restaurants (sushi, smoked meat, and more! ), and parking in the Forum is only $6 for the evening! The club holds 160 people in a cabaret-style setting, and our doors open 45 minutes before showtime, so you can come early and enjoy our full-service bar, pre-show video, and a few delicious nibbles, like fresh popcorn and corn chips with salsa. Then, before you know it, it’s showtime! You’ll see an MC, opening acts, and a world-class headliner! Every show lasts 90 minutes, and we play host to some of the best comedians in North America, as seen on The Tonight Show, The Late Show with Stephen Colbert, Just For Laughs, Conan, Comedy Central, The Comedy Network, and more! If you haven’t heard the name, or don’t recognize the face, it’s a comedy star you should know about! 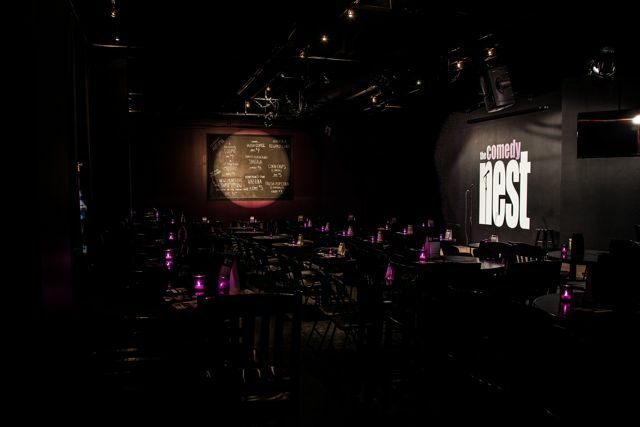 The Comedy Nest has been a memorable part of many nights out for over 30 years. If you’re looking for a place to laugh, celebrate, or just kick off a fun evening with friends, you’ve found it! Ernie Butler founded Montreal’s first comedy club in 1979 and called it Stitches. It was located downtown on Crescent Street for a few years before it moved to Bishop Street and was renamed The Comedy Nest. In the ensuing years, the club moved several more times, but always remained in downtown Montreal. The Comedy Nest stage was graced by such household names as Russell Peters, Jim Carrey, Tim Allen, Harland Williams, and Dennis Leary, to name but a few. The Comedy Nest has also been an official venue for shows during the world’s largest comedy festival, Just for Laughs. After Ernie Butler’s untimely passing in 2007, his children, Silver and Ryan Butler, carried on the proud tradition of presenting the best in stand-up comedy every week. Then, in 2012, they passed the torch to new owners and are now successfully pursuing other careers. Ernie Butler was involved in entertainment and hospitality in Montreal for more than 30 years. His reputation as an entrepreneur and a bon vivant followed him into the comedy business where he became known far and wide as a promoter of top-flight talent. Those who appreciated him for his energy and his devotion were rewarded with his support and his friendship. Ernie passed away on August 29th, 2007 after a brief illness. Donations to The West Island Palliative Care Centre in Ernie’s name are most welcome.